From the Roman ruins and the medieval districts, to the finest examples of modernism and the vanguards of the 20th century, Barcelona stores traces of its history in every one of its corners. Flanked by mountains and the sea, the city exudes a formidable balance between the traditional and the avant-garde, between its long history and the dynamism that is inherent in its way of life, which all combine into an impressive cultural and artistic heritage. Dalí, Gaudí, Miró, and Picasso are all proof of the fruitful relationship between Barcelona and the newest artistic trends, and they attest to Barcelona’s reputation for being the most modern and avant-garde city in Spain. The natural locations that surround it, the district markets, the lively squares, the museums and the theatres coexist in Barcelona, giving it multiple souls. This diversity and the energy that it radiates can guide visitors to enjoy the tranquillity of its hidden corners, its narrow, dark, streets and its almost enchanted squares, or equally to enjoy the highly contemporary cultural and gastronomic offerings. Barcelona is Mediterranean and cosmopolitan, “ it is elegant, bourgeois and modern, but hasn’t forgotten its roguish port background”. With its infinite vitality, there is always an aspect of Barcelona to fall in love with! Barcelona has ten easily accessible beaches that can be reached on foot or by metro. 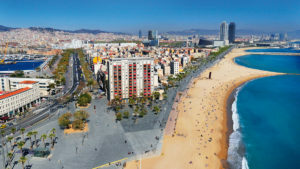 The most famous is perhaps la playa de la Barceloneta [PHOTO]. 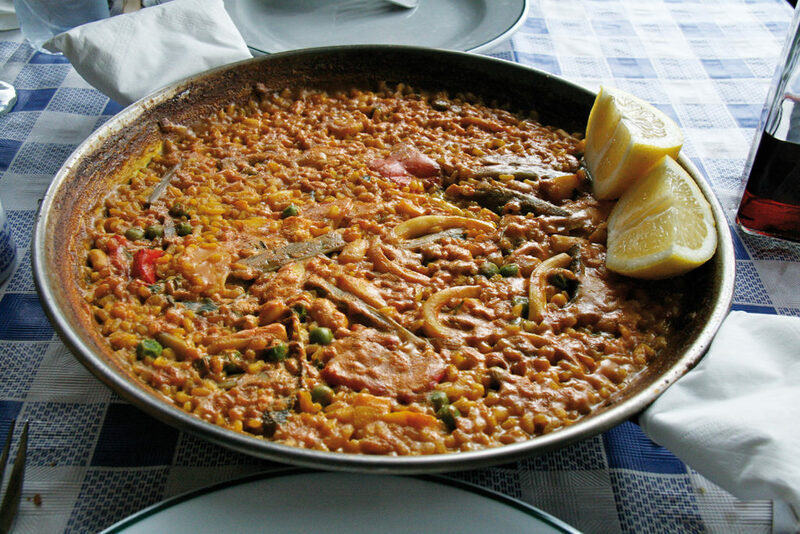 Along the beach fronts, you can find a number of good restaurants for eating paella. Further out from Barcelona, it’s also possible (and easy) to visit the Costa Brava which gets its name, “wild coast” from the uniqueness of the abrupt encounter between mountains and sea. Nature, climate, history and certain picturesque ports and villages have been enough to give it a world-wide reputation. Similarly, the Costa Dorada, south of Barcelona, is another excellent option. Its golden, luminous shores are the reason for its name (Golden Coast). Located on Carmel mountain, Güell Park was originally commissioned by the businessman Eusebi Güell from the architect Antoni Gaudí. A World Heritage Site, it is a park full of gardens and architectural elements characteristic of its creator’s work. A modernist jewel! A park with substantial green space and a lake where you can rent small boats. An ideal spot to while away afternoons or especially Sundays, when hundreds of young and not so young people get together to juggle. As well as Barcelona Zoo, you will also find the Palace of the Catalan Parliament. All right, this isn’t exactly an outdoor activity… but it is an obligatory visit for sport lovers, and football fans in particular! It is one of the biggest stadiums in the world and the greatest capacity in Europe. Barcelona FC offers you the chance to visit its museum and take a tour of the grounds to experience the locker rooms, tunnels and pitch first hand. Its official name is: Expiatory Temple of the Sacred Family. Gaudí’s famous church is one of the distinguishing features of the city and one of the most popular buildings in the world. A World Heritage Site, building began in 1883 and still hasn’t finished. Its eight imposing built towers, out of the 18 that Gaudí designed, and the impressive facades of the Glory, the Birth and the Passion, invite you to visit its interior from which you can climb some of the towers in order to contemplate a stunning view of the city. This legendary auditorium, designed by Domènech i Montaner, is a World Heritage Site, one of the largest examples of modernism and one of the most special concert halls in the world. It’s an impressive building with a striking exterior. Moreover, its excellent acoustics make it worth the effort to attend one of the top-level concerts hosted there in order to fully appreciate it! The journey from Plaza España leads you immediately up Avenida María Cristina where you will find the Magic Fountain (where they perform a pretty light and water show) and the National Museum of Catalan Art (MNAC) (in the flagship 1929 International Exposition building, containing pieces from all the arts – sculpture, painting, installations, drawings, prints, posters, photographs and coin collections – from Roman times up to the mid-20th century). As you ascend, you come to the Spanish Village (a microcosm created for the International Exposition of 1929 to illustrate the diverse architectural styles used in different regions of Spain, a network of alleyways with artisans, restaurants, cafés…). The long promenade eventually leads to good views over Barcelona and the sea. A reference point for the formative years of Pablo Ruiz Picasso. It houses a wealth of more than 3,800 works, which make up the permanent collection and offer an ample programme of temporary exhibitions. It occupies the impressive building by American architect Richard Meier in the Plaza dels Àngels, in the district of Raval. It offers a multitude of perspectives that seek to generate critical debates on art and culture. If you get lost, follow the sound of skaters! The Passeig de Gràcia is one of Barcelona’s best shopping streets. The ground floors of the impressive modernist buildings house restaurants, cafés, jewellery shops and such well-known fashion labels as Louis Vuitton, Loewe, Armani, Cartier, Gucci or Yves Saint Laurent. 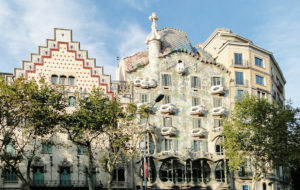 It is the perfect combination of commercial and cultural offerings because you encounter some of the best-known modernist buildings: Casa Milà (or Gaudí’s “La Pedrera”), Casa Batlló (another of Gaudí’s works), Casa Amatller (built by Puig i Cadafalch), Casa Lleó Morera and Casa Fuster (both works by Domènech i Montaner) and, fairly close by, in the Diagonal, Casa de les Punxes (or “Casa Terrades”, also by Puig i Cadafalch). Walking through Ciutat Vella. The old Barcino, the essence of what we know today as the city, where Roman ruins cohabit with the medieval gothic. 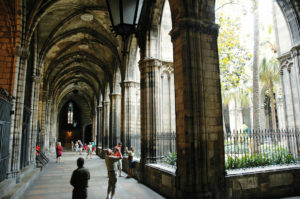 A fascinating maze of streets and squares that are an open book on the history of Barcelona. The city cathedral rises up there, a great example of 19th century Gothic Catalan architecture. “Las Ramblas” is one of the arteries of the city, just under a kilometre long, that connects Plaza Cataluña with the city’s old port (where you will find the emblematic statue of Columbus). A stroll down this busy street would not be complete without visiting the Liceu Theatre (Barcelona’s opera house and stage for the best singers in the world) and the Boqueria Market (a market par excellence, with vibrant stalls that sell every kind of food). Mount Tibidabo. It is the highest peak in the Sierra de Collserola mountain range, and it is one of the best viewpoints from which to see the city. You’ll find the oldest amusement park in Spain (opened in 1899), the spectacular Gothic Revival Sagrado Corazón temple (whose summit can be reached by a lift), the original chapel from 1886 (to the right of the temple), the Collserola Tower, built thanks to the 1992 Olympic Games) and the Fabra Observatory, built in 1901. Agbar Tower. Since its inauguration in 2005, the “Aguas de Barcelona” tower has become a symbol of the city. This building warrants a visit at night, as its 34 floors are illuminated in different colours over several hours by the 4,000 LEDs installed in the façade. The Gràcia district. It is charismatic, bustling, cosmopolitan and bohemian. In Gràcia, neighbours who have lived there all their lives cohabit with exchange students, gypsies who play music in the street with bohemian artists looking for inspiration, young people and not so young people who greet each other in the squares while queuing outside the independent cinema. It is the perfect place to go out for a few drinks with the most authentic atmosphere in Barcelona. 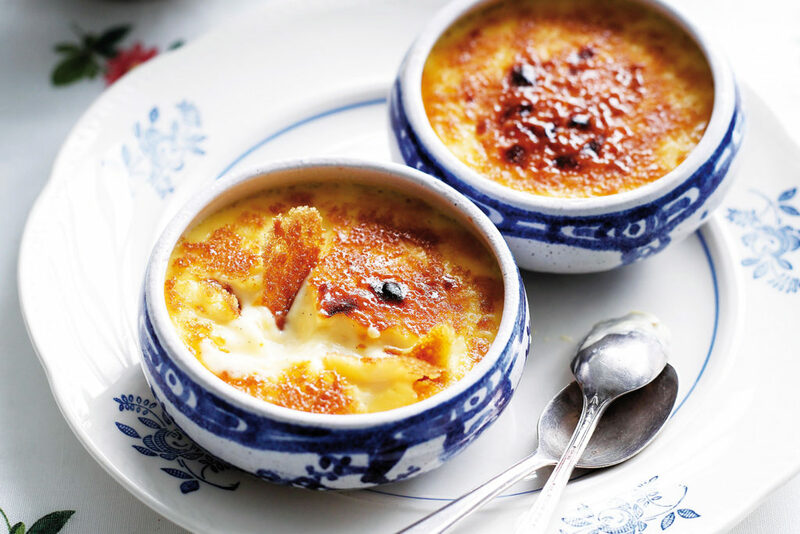 Few cities in this world can guarantee a first-rate gastronomic experience. Barcelona’s food is a great example of the marvels of the Mediterranean cooking of Catalan, combining land and sea, meat and fish. Barcelona exemplifies the rich and traditional gastronomy of the country which has been passed from generation to generation over many centuries and has been saturated with cultures from many diverse civilizations. Going out to eat, by far, is the primary leisure activity of Barcelonians, and to check it out, just take a walk down the streets of the city to fully appreciate the extensive number of eating establishments. Many of those locations, in addition, have terraces on which residents of Barcelona love to eat outside. With the good weather, the terraces of the city are perfect for eating out in the open air. The Catalonian cuisine is full of characteristic dishes that even today continue to be developed and served in many traditional restaurants, dishes that can be tasted in longstanding traditional establishments and even in urban homes that transport us to other times. Barcelona’s basic recipe book is made up of dishes like the popular bread with tomatoes, with ham or without; the escalivada, a salad with peppers, eggplants and other roasted vegetables, which is an authentic classic; the empedrado, another essential dish consisting of a cod salad with white beans; and if we want something more filling, we would bet on escudella, a vegetable soup with thick noodles and rice, boiled with white beans or cooked. In regards to the different types of meats, there is a preference for pork: there are more than fifteen varieties of sausages, but the most familiar is the butifarra, the star dish being the butifarra with white beans. As for pastries, the most famous are the Catalan cremes or the panellets, elaborate cupcakes with ground almonds, pine seed, cocoa and coconut which are prepared especially in November. 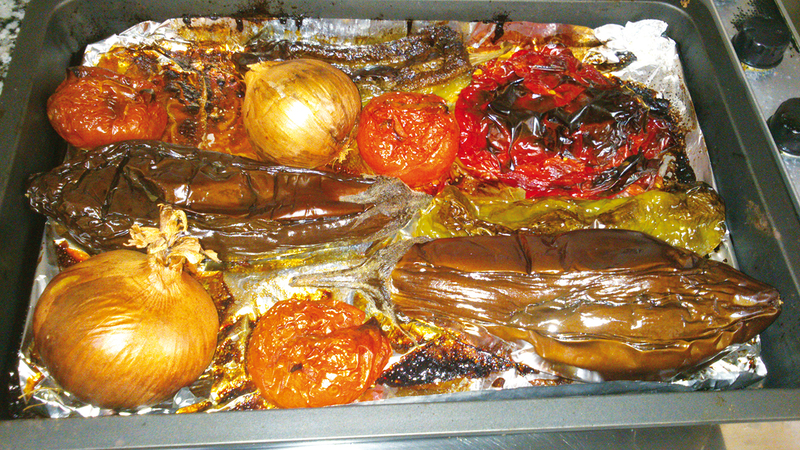 There are many restaurants where all these traditional dishes can be tasted. The Barcelona Symposium has a range of features that make it stand out from the other symposia held so far. Barcelona, capital of the Mediterranean, next to the sea and with an important historical legacy, will fully embrace the symposium’s activities. 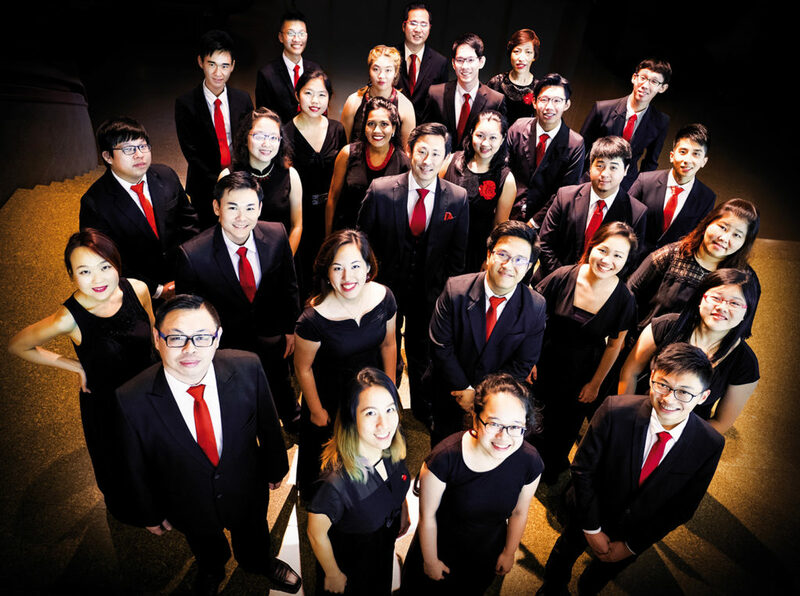 The choirs selected to take part will not just perform for those who registered for the symposium, but for all lovers of choral music; they will give public concerts in various public spaces in Barcelona and the surrounding areas. But that’s not all. The Barcelona Symposium has introduced a new way to participate, opening its doors to choirs from around the world, including choirs that were not selected to take part in the symposium and choirs that are interested in playing an active part in the conference programme and giving concerts. These choirs will also get to experience the musical atmosphere of the symposium for a few days and will give concerts within the framework of the special CIRCLE CONCERTS programme, included as part of the symposium and the 52nd International Festival of Choral Music in Barcelona. 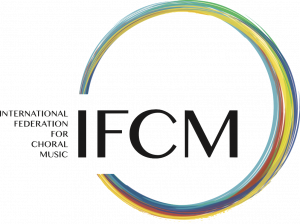 We wish to organise as many concerts and activities related to choral music as possible during the symposium, and to make Barcelona and Catalonia a centre for cultural exchange with participants from around the globe. The North Coast Chorale, USA. 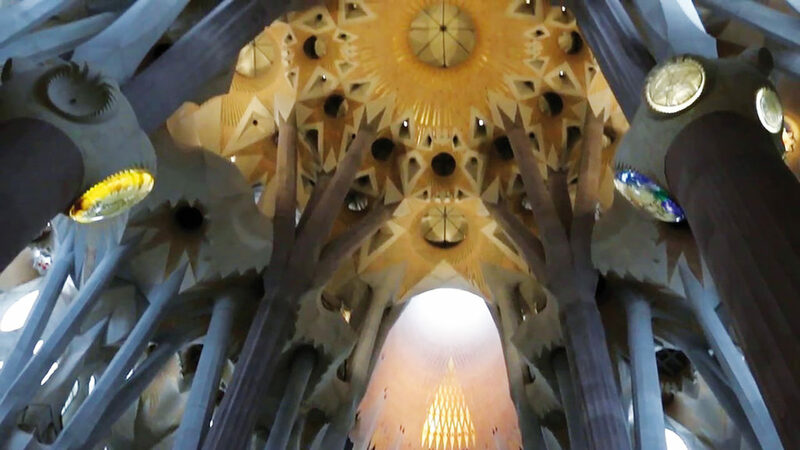 On 26 July, a very special concert will take place in the basilica of the Sagrada Familia in which all symposium participants will be able to take part. This cathedral, a well-known emblem of the city of Barcelona, has already hosted a number of extraordinary choral concerts in recent years, including a concert on the day of the consecration of the basilica in the presence of Pope Benedict XVI, for which we organised a choir of 500 singers. 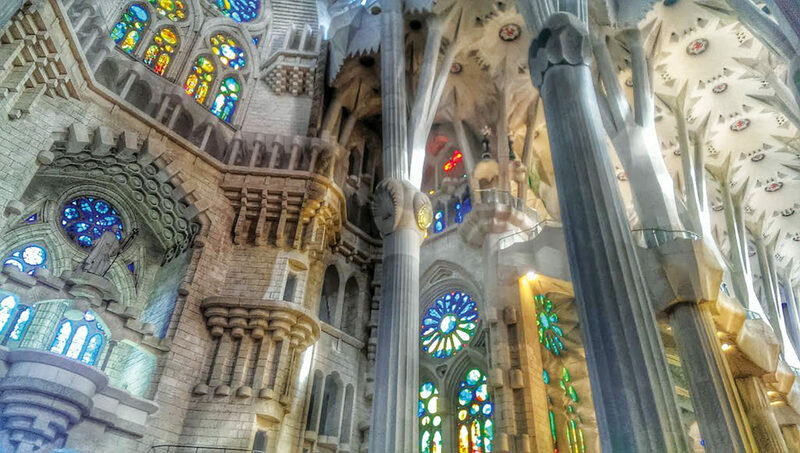 Hosting the global symposium in Barcelona is, without question, a unique occasion, and the Sagrada Familia is the perfect venue for the global choral community to come together. All participants will have the chance to share the extraordinary experience of a concert in this imposing cathedral and marvel at Antoni Gaudí’s design. Some of Catalonia’s finest choirs are preparing a carefully chosen programme for the concert, which will trace the sacred choral music of the region through the centuries. Starting with Gregorian chant, we will then hear works based on the devotional texts of the Llibre Vermell de Montserrat, as well as works from Catalan composers including Joan Cererols (1618-1680), Francesc Valls (1671-1747), Narcís Casanoves (1747-1799), Ferran Sors (1778-1839), Pau Casals (1876-1973) and Josep Vila (1966-), before finishing with two contemporary works composed especially for the Sagrada Familia by Bernat Vivancos (1973-) and Raimon Romaní (1974-). The opening and closing concerts will also be special occasions, full of surprises that will be revealed one by one. They will be held in the magnificent Sala Pau Casals del Auditori in Barcelona, a concert hall with superb acoustics that will host the majority of the official symposium concerts. 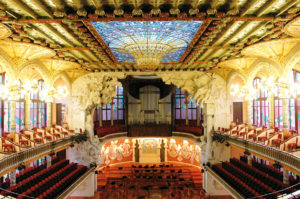 However, it is impossible to think of choral music in Barcelona without considering the city’s most iconic venue: the Palau de la Música Catalana. This building, an icon of Catalan modernism, is home to the Orfeó Catalá and is one of the most world’s most important, dynamic and renowned centres for choral music. Located in the centre of the city, it was designed by Lluís Domènech i Montaner, and some of the most important master builders of Catalan modernism were involved in its construction. 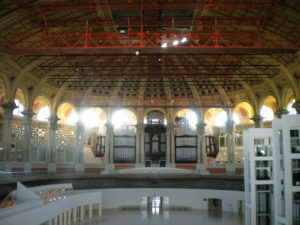 Declared a UNESCO World Heritage Site 20 years ago, the building is a homage to music and the proud historical traditions of Catalan music in particular. This splendid venue will host two of the official symposium concerts. 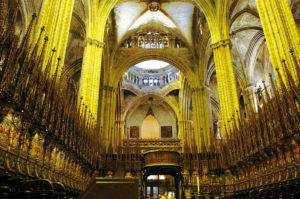 During the evening, there will be concerts performed simultaneously by the invited choirs in various different parts of the city: in the heart of the Gothic Quarter, in the churches of Santa Maria del Pi, Sant Felip Neri and Sant Pere de les Puelles (the latter is one of the oldest in the city); in the Santa Maria de Gracia, located in the heart of one of the most picturesque of Barcelona’s districts; in the Auditori Caixa Forum at the foot of the Montjuïc hill, an auditorium located in the modernist surroundings of the old Casaramona textile factory, designed by renowned Catalan architect Puig i Cadalfach between 1919 and 1912 and now one of the city’s most dynamic cultural hubs; and in the Auditori del Conservatori del Liceu, located in the Raval district right by the historic city centre, where there is a new building housing the Conservatorio Superior de Música del Liceu. This auditorium is located on a prestigious thoroughfare linking the Rambla with the Avenida del Parallel, famous for its theatres. In addition to the conferences, masterclasses, concerts, communal singing, new compositions and everything else we have already described, in a few days’ time, we will post details on our website of the wide-ranging programme of presentations, of which there will be around 50. The presentations will be 45 minutes long and will be divided into the following subject areas: Choral Heritage, Publishers, Composers, Institutions and Activities.